This year the Southern Graphics Council Conference is happening in Chicago and it began yesterday. If, like me, you can't be there and wish you could, I offer you some links to online SGC-related material that may help tide you over. 2. BadAtSports Podcast interviews with Mark Pascale (Curator of Prints and Drawings, Art Institute of Chicago), Debora Wood (Senior Curator, Northwestern University’s Mary and Leigh Block Museum) and Christine Tarkowski (Associate Professor, Fiber and Material Studies, School of the Art Institute of Chicago) about the current state of Printmaking. Long, but a fascinating broad view of the field. 4. The folks at Printeresting have posted a couple of reports from Chicago so far. Genealogists estimate that there are about 1 million descendants of Mayflower passengers John and Priscilla Alden and their 10 children. At this point in time, after 12 or so generations, these million people represent just about every nationality, religion and ethnicity -- a mirror of the general population of the United States. I want to make a few prints about John and Priscilla because I'm one of those million or so descendants. The illustration above is how an artist named A.S. Burbank pictured John and Priscilla back at the turn of the 20th century. Obviously no one really knows what they looked like, but I'm going to take out my artistic license and give it a go myself, Japanese woodblock style! The horizontal stripes superimposed on Lincoln are in the shape of I Ching hexagram #8 which signifies Union -- a central figure around whom other people can unite, a figure who can bridge gaps. 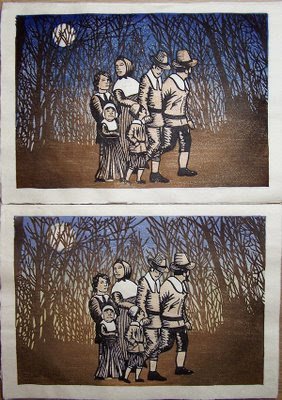 I feel like I haven't made a woodblock print for weeks. I think that's actually true. Today I found some time to start editioning the I Ching Abe print for the (Un)Limited Exchange. The exchange has a group Flickr page if you'd like to see what some of the other participants are doing. 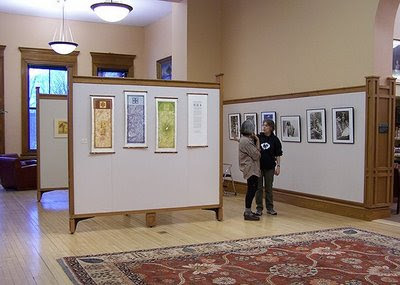 The reception last night at the Hosmer Gallery / Forbes Library was wonderful. We had bought enough food and drink for 200 people, and it was all gone two hours later. Especially the wine! People had a great time, including me. I'm an introvert by nature, but if I do up my hair and put on some clothes that make me feel like an extrovert I do OK. And talking about printmaking is pretty near my favorite thing to talk about, so it was a great evening. Thanks to everyone who came, and also to those who sent their good wishes. Here are some photos from the evening. My neighbor Marilyn was the first person to buy a print. Thanks Marilyn! The woman in blue is a wonderful artist herself, Anna Brahms. Check out her amazing dolls. We three artists who were sharing the space gave a little talk. So many dear friends came. And some folks from Northampton's Young at Heart Chorus! When I hung my Three Prophets prints above my living room sofa I decided that I wanted them to look like scrolls, so I devised an elaborate method involving two pieces of wood, some felt and three little screws. It also involved making a small hole at the top of each print -- OK for my own set of prints but probably not so cool for a print I hope to sell to someone else. So here's another scroll-type mounting system I cooked up for showing the prints without harming them. Materials: strips of wood, strips of acid-free mat board, binder clips. I found some simple 3/4" pine moulding with rounded edges at Home Depot in the lumber section, which I cut about an inch wider than the prints. I sanded and stained the wood, then cut some 3/4" strips of spare mat board to the width of the print (not the extra width of the wood). The mat board protects the back of the print from the clips. For binder clips, I found some medium size clips in a classy brass finish that I thought would look nice. Position a strip of mat under the print. Position a strip of wood on top of the mat and the print. Adjust this print sandwich until it's even. Clip one side a couple of inches from the end of the wood. Clip the other side the same way. ...and remove them from the clip. SAVE THE HANDLES so you can put them back in to remove the binder clips again later. Follow the same procedure for the bottom of the print too, and voila! Important note: Sharri LaPierre comments that wood is highly acid. She suggests that if the prints are mounted in this way for any length of time some kind of ph neutral barrier, such as glassine, should be added to the back of the wood where it touches the print. Very good point! There seems to be a kind of mass movement, at least among my own friends and acquaintances, to social networking sites. Facebook, which I always thought of as a place for kids, is now peppered with people my age finding old pals or even linking up with people who live just down the street. Twitter is a strange little application that I'm also playing around with. It's like mini-blogging. I'm not quite sure if I like it, seeing as how I'm not a person short on words and Twitter only gives you 140 characters per "tweet." 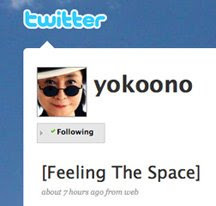 But Yoko Ono twitters and we're "following" each other, so that's pretty cool. While I was framing and preparing for the Hosmer Gallery show I was also frantically printing this piece, as I didn't want to display "Worried About the Kids" without this one, which I consider a companion piece. I hope you'll forgive me for not documenting the progress this time. Of course I ended up printing it twice because I was rushing. I did a dark sky and then felt like it wasn't right so I did a version with a lighter sky. By the end, I liked them both, so I have a sort of double edition. The pigments I use are pure pigment suspensions from Guerra Paint & Pigment in NY (see sidebar for link) and I love them, but every pigment has distinctive properties. The brown in this print is called burnt umber dark and it has a really interesting texture that I can only describe as fluffy. It almost whips up as you stir it. I like it, but it took a little getting used to. I'm also not a huge fan of sumi ink even though everyone raves about it. I find it kind of sticky and it seems to dry really fast and when it's dry on the block it gets almost slick or shiny. It sure is BLACK, though. Anyhow, these poor Pilgrims have no idea what they're in for, do they? We don't know what we're in for either. Yesterday afternoon, after a foot of snow had fallen and the flurries kept on coming, Lynn and I loaded up the Honda with 25 framed prints and various other sundries and drove ourselves the 1/2 mile to Hosmer Gallery. We were full of the kind of optimism that only rank beginners possess: "It'll probably take us 2 or 3 hours." Four and a half hours later, with some great tips from our gallery mates, we were hung. Here are a few photos from the adventure. The Forbes Library is a beautiful old building. The gallery is in a large space on the second floor and usually two artists share the gallery, left and right. I'm sharing the space with a duo, photographer Ellen Augarten (right) and UCC minister Andrea Ayvazian who have created a book in which the 150 Psalms of David have been rewritten by a cross section of 'ordinary' people from our community with an accompanying photograph of each. 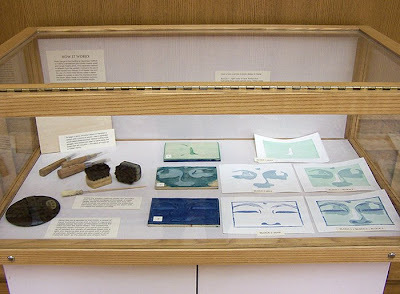 I got to play museum curator and create a display case showing how to make a woodblock print. I think that people appreciate the prints a lot more if they can see how they're made. Yucking it up during the hanging.